Hack Your Way To Growth With Social Media Advertising. Social media advertising hacks to help you get the most out of your ads budget. Whether your ad budget is $100 or $1 million, everyone has their eyes on getting the most bang for their buck. Poor targeting, weak messaging and a host of other fixable errors can plague even the most experienced social media hands. But there are a few quick social media advertising hacks you can use to squeeze all the value out of your budget. Test out an ad before spending a dime. Review the engagement of your current social postings. If you have a post that’s generating organic engagement, consider turning this post into a paid ad. All ads on Facebook are basically posts that are configured for paid distribution. Our Falcon platform provides a quick and easy way to promote organic content. To pick the right posts establish engagement benchmarks. This will save time when determining if a post is worth paid promotion. Bear in mind though that benchmarks aren’t one size fits all. To determine an engagement benchmark for your company, consider your number of followers, industry engagement rates and competitors. Spending a little in the service of greater savings later on can also be a wise move. If you set aside some of your budget to try various targeting configurations, the things you learn can be both useful for paid ad campaigns, but also for your sales department. For example, you might A/B/C test between age ranges and demographics to see who is most responsive to your pitches. Be sure to tag these tests’ inbound traffic with Google Analytics so you can follow on-site behavior from each target audience. 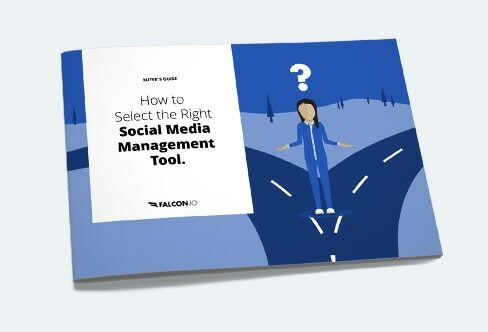 You might be surprised to see that the results vary from platform to platform, which is useful information to have when planning a cross-platform social calendar. Facebook Lead Ads are an easy and invaluable way to collect a prospect’s information. You can set up an ad with a ‘Sign up’ call to action. When a user clicks, a form will autofill with contact information pulled from Facebook. The form is optimized for mobile, which is a necessity given what we know about how people use the platform. Once you’ve collected leads, you can upload them to Falcon Audience as a CSV. From there, you can use the new information to further enrich your audience profiles. Facebook and Instagram will allow you to advertise just to those people, or create lookalike audiences of users who share characteristics of those motivated leads. Social media conferences can be very pricey. But even if you don’t have the budget to attend, you can still have the opportunity to reach attendees. The people who attend social media conferences tend to be very social. Many conferences have hashtags, for example, #SMW17, #SMMW17, #DMWF. When you determine which hashtags to target, you can create an audience of users using that hashtag. Make the effort to use content directly relevant to the major themes and trends of the conference. You don’t want to show-up to the party empty handed, make sure you bring something to share. If you’re looking recruit new employees for your company, LinkedIn is the place to look. LinkedIn job postings offer targeting and tracking for a cost. The cost of placing a job posting is determined by title and geographic location. If you’re strapped for cash, you can publish and share a standard post in the relevant LinkedIn Group and within your personal network. This way you can amplify your message within relevant networks without paying recruitment costs. That means the people to your right and left right now. Something that we have seen work is simply encouraging your trusty coworkers to hit the like and share buttons on your promoted posts. As well increasing the number of eyeballs falling on your posts, this adds an element of endorsement and credibility. As social media animals we are highly susceptible to social proof, notably endorsements from friends and peers. Harnessing your coworkers’ networks and the social power of their endorsement can prove a potent – and entirely free – tactical hack. For a lot more social media hacks and advice see our Essential Marketer’s Guide series covering Facebook, Instagram, Twitter and LinkedIn. You can download the Facebook edition below.